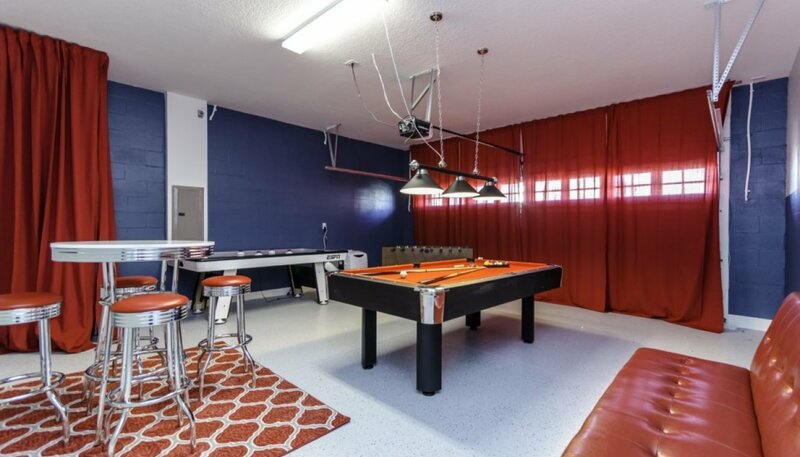 Spacious 8 bedroom, 5 bathroom villa sleeping up to 16 guests, boasting luxury amenities and decor, great games room, 9 seater home theatre with 106" projection screen, entertainment loftwith 65" LED cable TV, family room with 65" LED cable TV and 43" LED cable TV's in all bedrooms (5 kings, 2 twins & 1 bunk), privately enclosed east facing pool with raised spa. 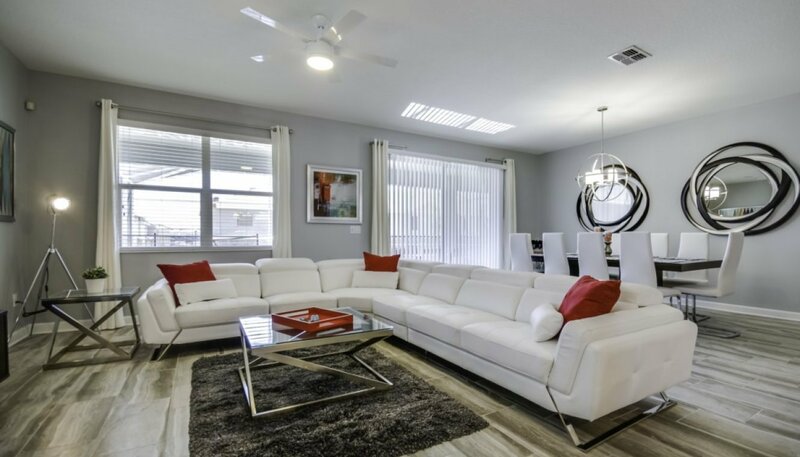 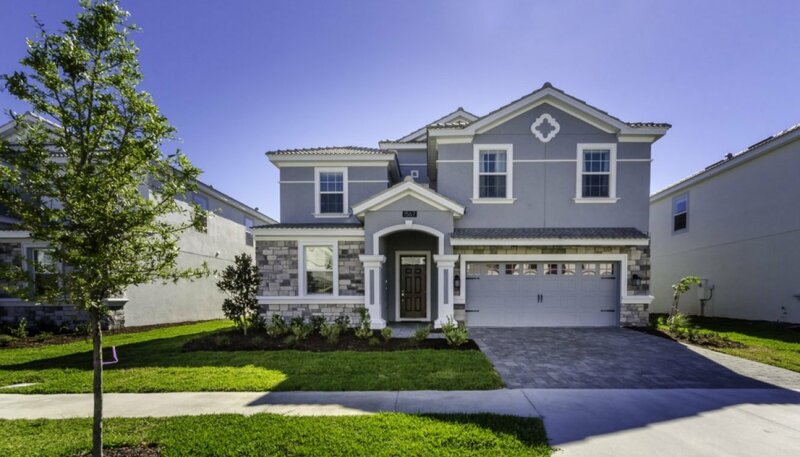 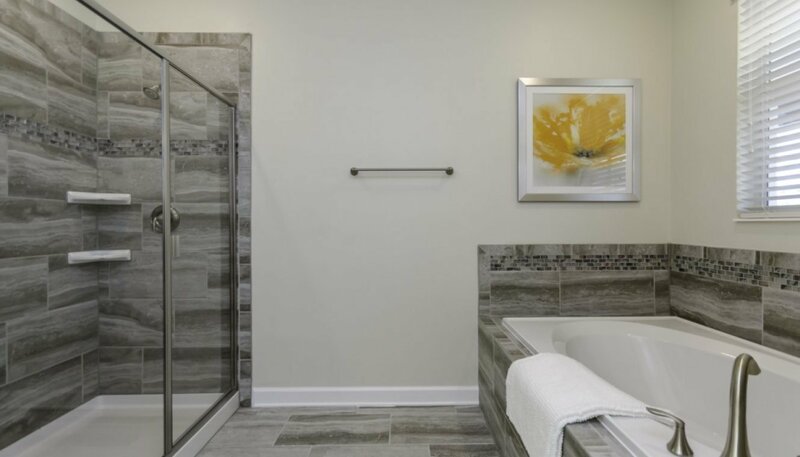 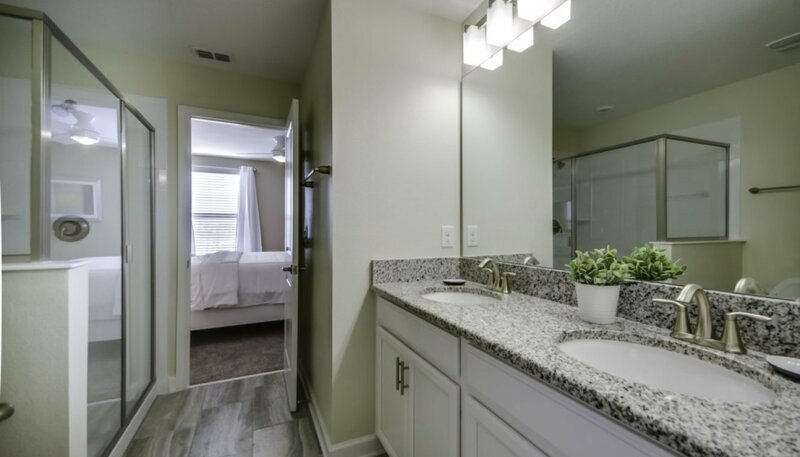 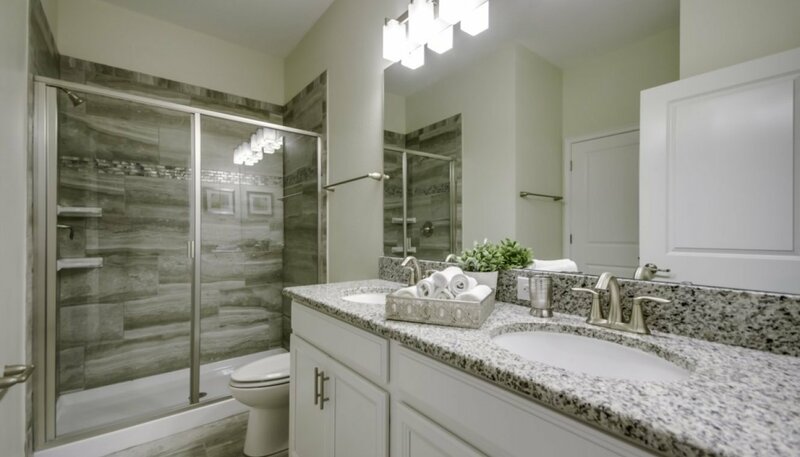 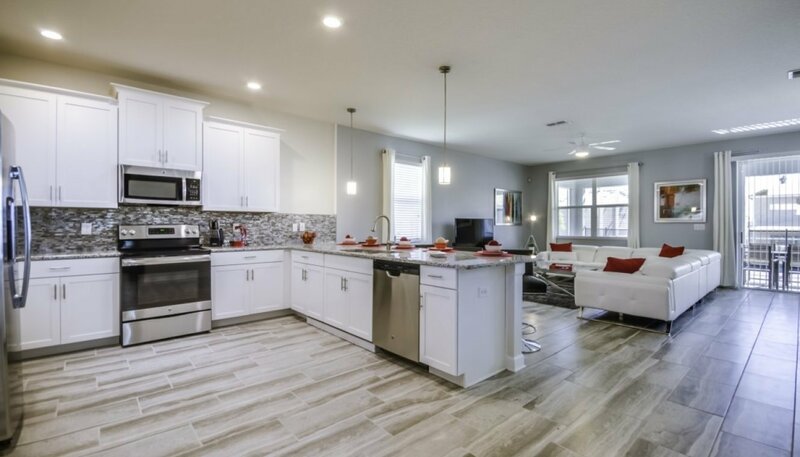 Additional luxury features include a chef's dream kitchen with granite countertops & quality stainless steel appliances. 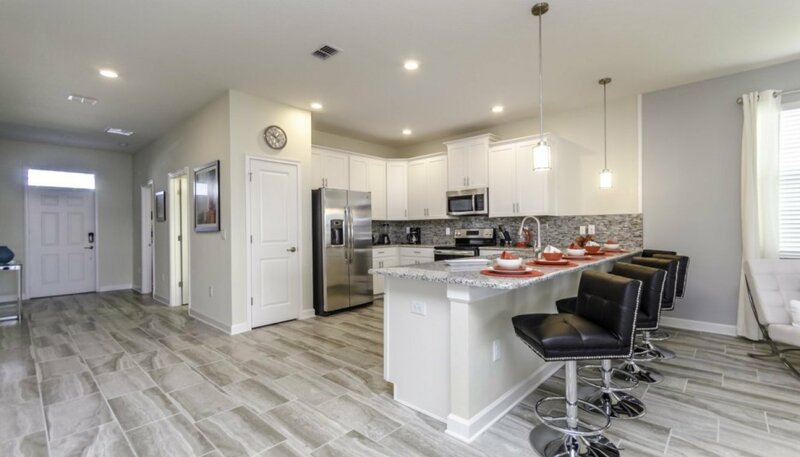 The breakfast bar comes with 5 bar stools to offer an informal dining space. 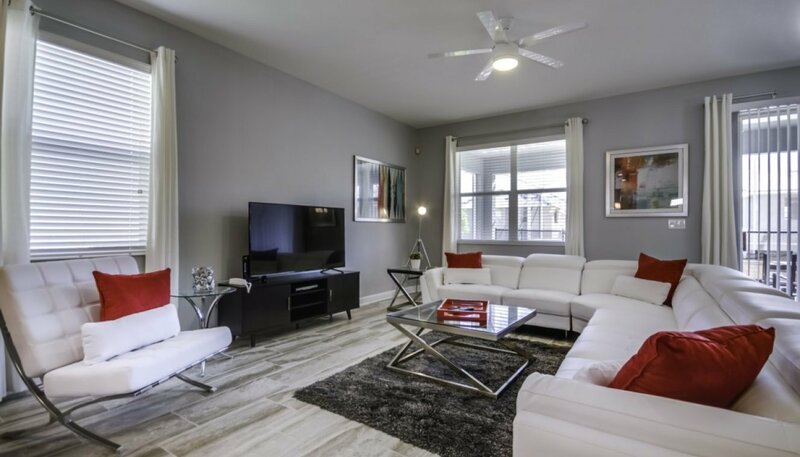 The comfortably furnished room with great views onto the pool deck offers ample seating on a sectional L shaped white leather sofa for you to relax and watch the 65" LED cable TV with Blu-Ray DVD player. 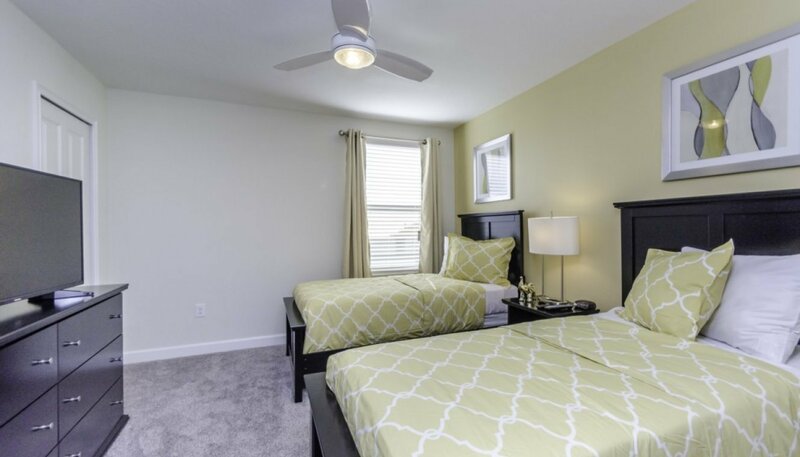 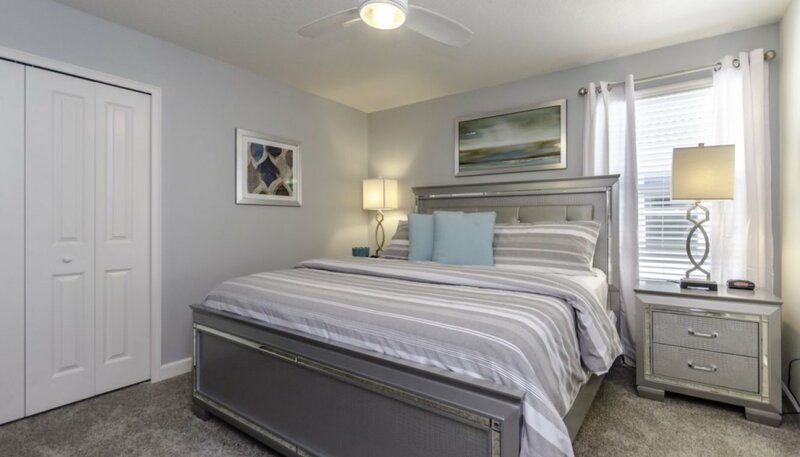 The large master bedroom has been furnished with a king sized bed, matching nightstands, chest of drawers with 43" LED cable TV above, ceiling fan, alarm clock and walk-in wardrobe. 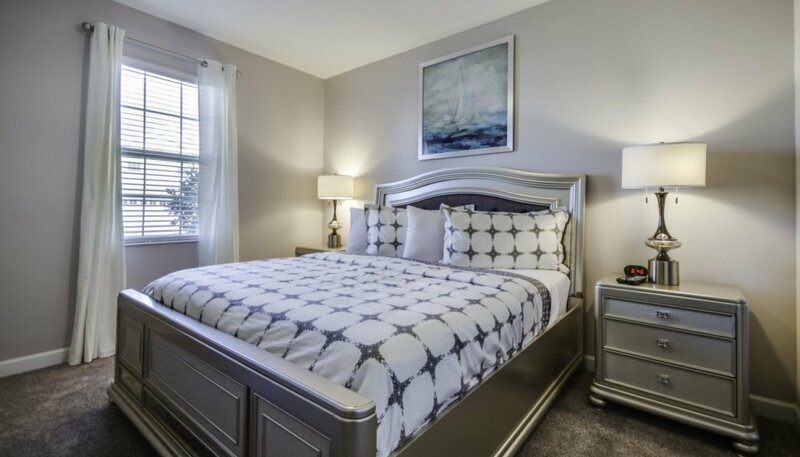 The second master bedroom with its wonderful views over the front gardens has been furnished with a king-sized bed, matching nightstands, chest of drawers with 43" LED cable TV above and built-in wardrobe. 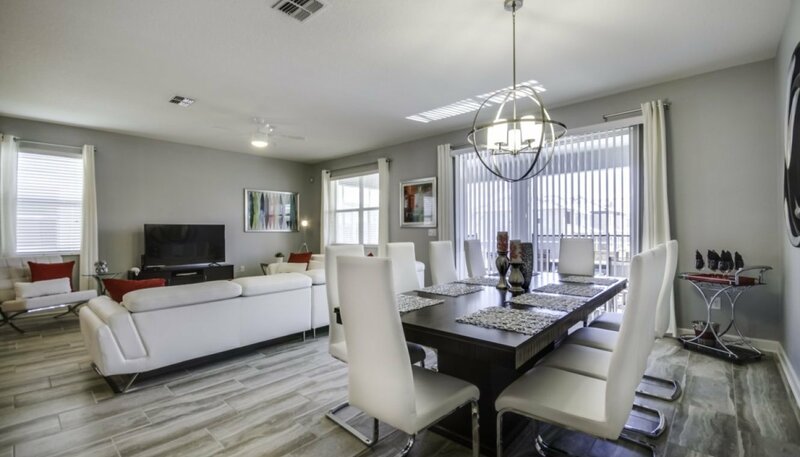 The large pool with east facing deck has 4 sun loungers for your sunbathing comfort and a patio table with 6 chairs under the shady covered lanai. 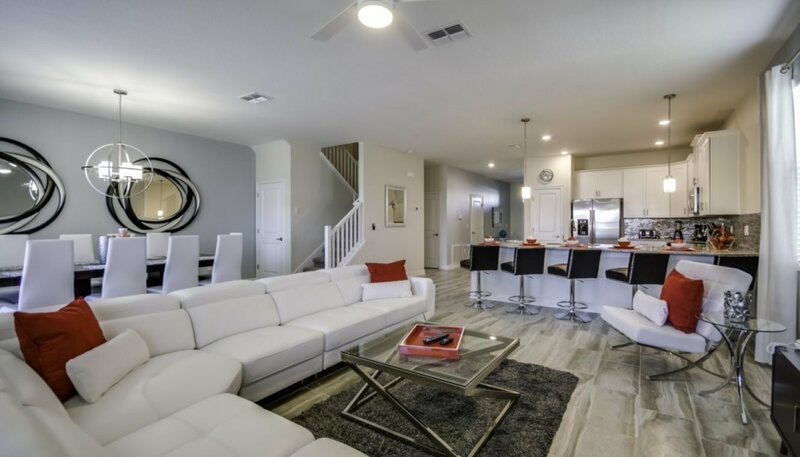 It is only a 9-minute walk (or 2 minutes in a car) to the excellent resort Oasis Club at ChampionsGate with its two pools including a waterpark with splash zone, lazy river, poolside tiki bar with cabanas, hot tubs, tennis, volleyball, and basketball courts, clubhouse bar and restaurant, games room, movie theatre, fitness centre, sundry shop and children's play center. 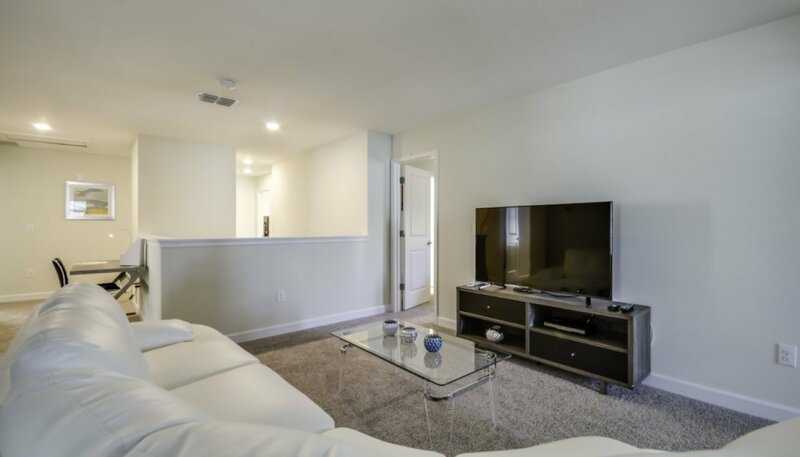 The large seating area located at the top of the stairs has a brown leather 2 seater sofa, pool table and a 63" LED cable TV with Blu-Ray DVD player which is an ideal place to escape the buzz and excitement of downstairs, for some real relaxation time. 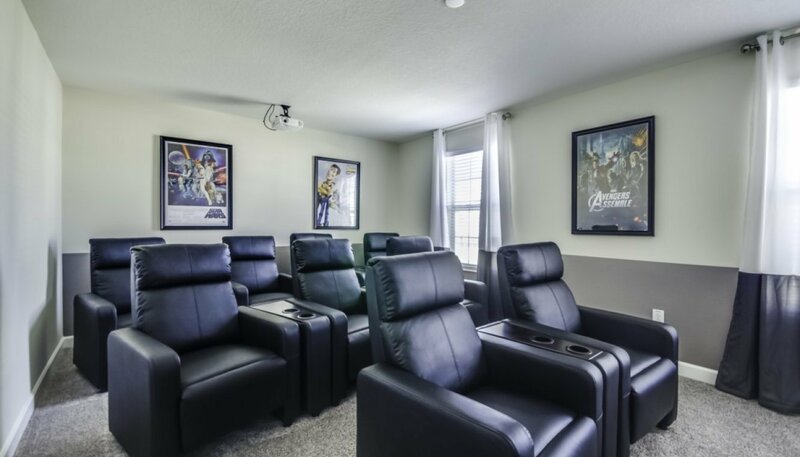 Home theatre room with 9 leather armchair seating. 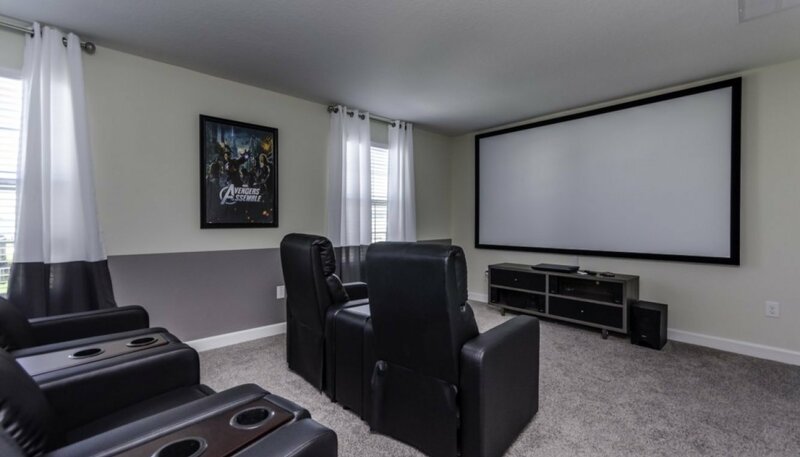 Enjoy your favourite movies on the 106" projection HDTV with Blu-Ray DVD player and surround sound. 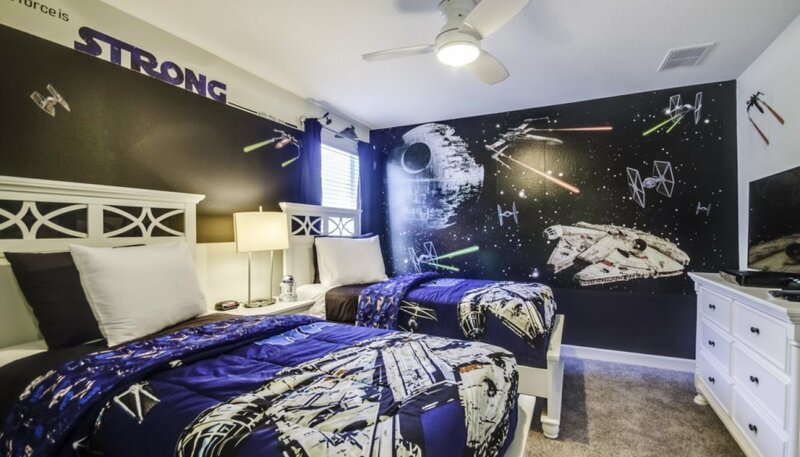 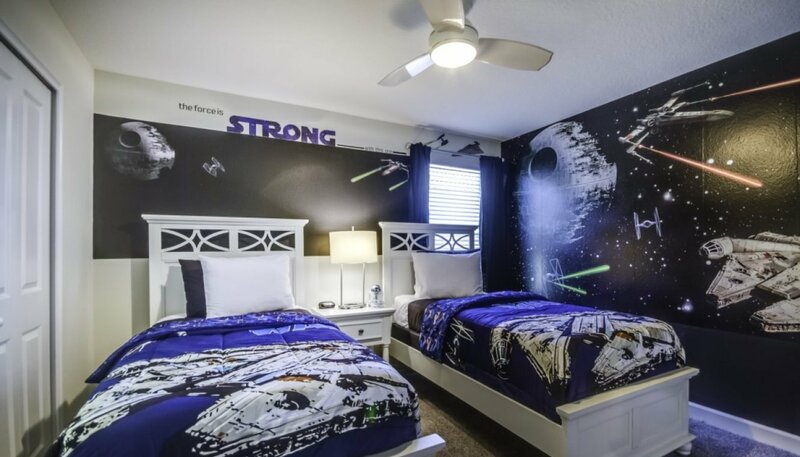 This amazing Star Wars themed bedroom comes equipped with twin beds with matching nightstand, chest of drawers with 43" LED cable TV above, DVD player, alarm clock, ceiling fan and walk-in wardrobe. 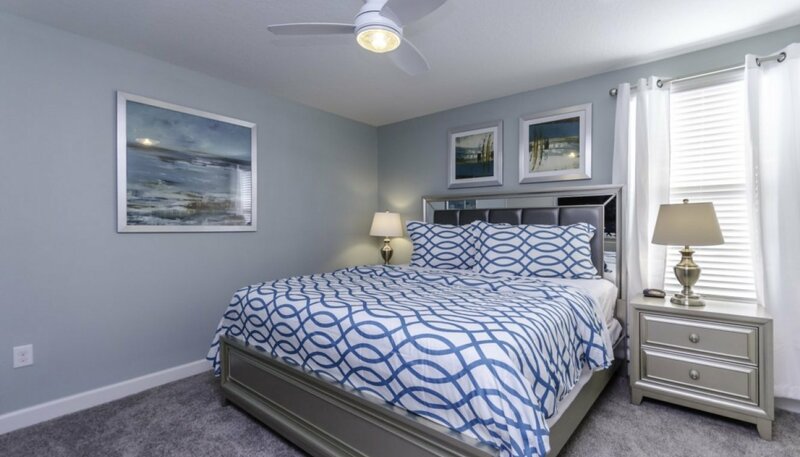 This bedroom with views over pool deck comes equipped with 2 twin sized beds with matching nightstand, chest of drawers with 43" LED cable TV above, ceiling fan, alarm clock and built-in wardrobe. 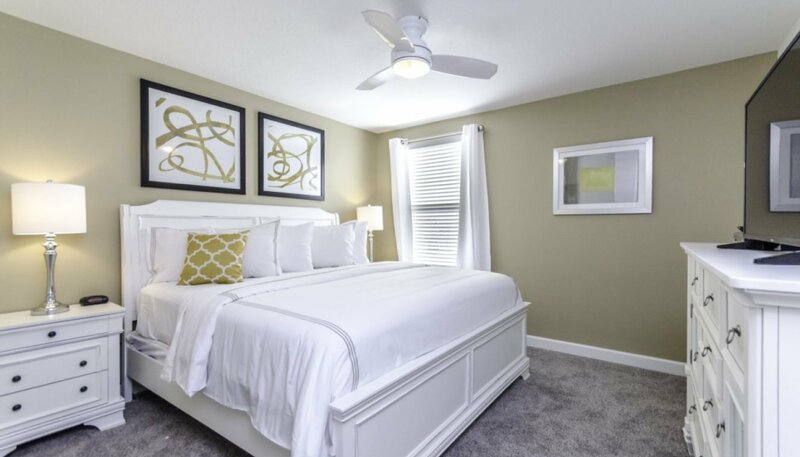 This bedroom comes equipped with a king sized bed with matching nightstands, chest of drawers with 43" LED cable TV above, ceiling fan, alarm clock and built-in wardrobe. 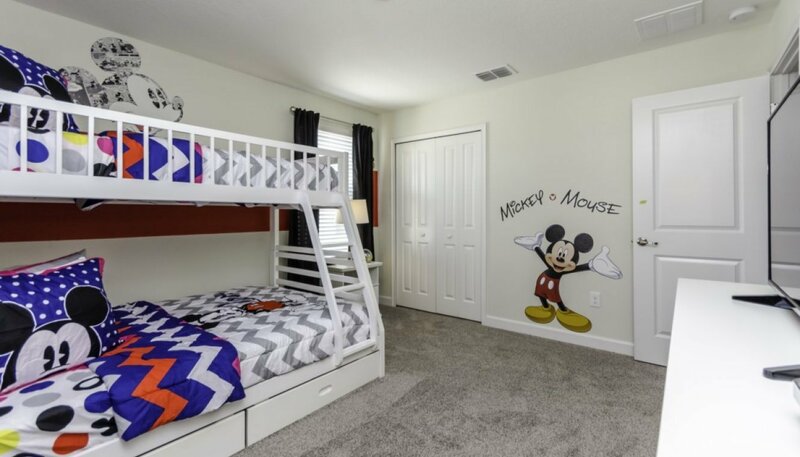 This Mickey themed bedroom comes equipped with bunk beds (twin over full-size), single nightstand, chest of drawers with 43" LED cable TV and built-in wardrobe.